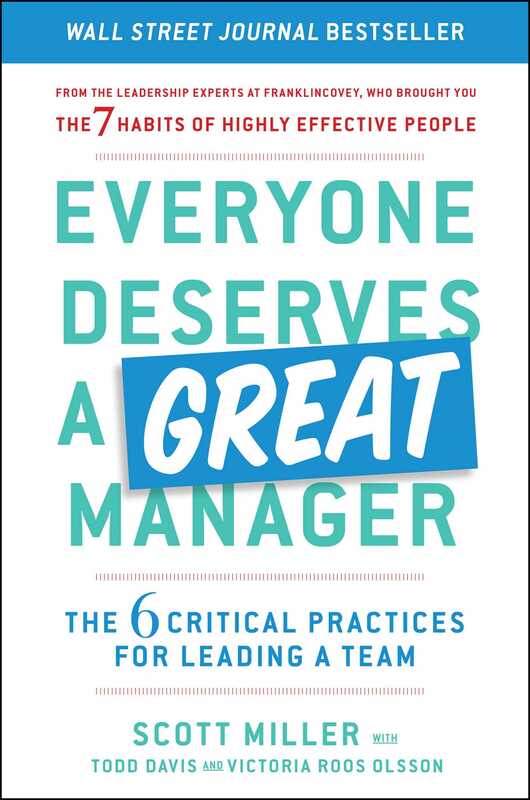 From the organizational experts at FranklinCovey, an essential guide to becoming the great manager every team deserves. A practical must-read, FranklinCovey’s Everyone Deserves a Great Manager is the essential guide for the millions of people all over the world making the challenging and rewarding leap to manager. Based on nearly a decade of research on what makes managers successful—and includes new ways of thinking, tips and techniques—this volume has been field-tested with hundreds of thousands of managers all over the world. Organized under four main roles every manager is expected to fill, Everyone Deserves a Great Manager focuses on how to lead yourself, people, teams, and change. Readers can start anywhere and go everywhere with this guide—depending on their current problem or time constraint. They can pick up a helpful tip in ten minutes or glean an entire skillset with deeper reading. The goal is for the busy manager to know what to do and how to do it without interrupting their regular workflow. Each role highlights the current, authentic problems managers face and briefly explores the limiting mindsets or common mistakes that led to those problems. With skill-based chapters that cover managerial skills like one-on-ones, giving feedback, delegating, hiring, building team culture, and leading remote teams, the book also includes more than thirty unique tools, such as a prep worksheets and a list of behavioral questions for your next interview. An approachable, engaging style using real-world stories, Everyone Deserves a Great Manager provides the blueprint for becoming the great manager every team deserves. Scott Miller is a former correspondent for The Wall Street Journal. The author of Agent 110: An American Spymaster and the German Resistance in WWII, his first book, The President and the Assassin: McKinley, Terror and Empire at the Dawn of the American Century, was a Newsweek “must read” summer selection. Mr. Miller spent nearly two decades in Asia and Europe, reporting from more than twenty-five countries. He lives in Seattle.